And, then, you add heavy whipped cream to the top of the dessert. It does taste amazingly good, but it turns an otherwise incredibly healthy food into a dessert disaster. Over on Facebook, a reader suggested using an Angel Food cake as a substitution for the shortcake and I thought that was an interesting idea. Angel Food cake is basically egg whites and sugar, so you get volume without too many calories. Because I am super lazy, I purchased an Angel Food cake from my local Stop & Shop for $4.99. After I brought it home, I cut it in half and put one half into my freezer. The label on the side of the cake said "8 Servings" but I decided it was more like "16 Servings" - this cake is LARGE. So, one slice of my new serving size is about 75 calories. You can also bake your own which is pretty easy. I made low fat angel food cake last month and it was much more tasty than the store version (but not everyone has time for that). Then, I used 1 pound of strawberries and mashed up about half of the berries (after washing and hulling them) and just tossed them into a plastic container. I didn’t add any sugar because they tasted sweet to me. At dessert time, I poured my "no added sugar" concoction onto the "almost entirely" sugar Angel Food cake and waited for my children to complain that it wasn't sweet enough. Guess what? They liked it! The cake added all the sweetness that was necessary to be dessert - and my children inhaled a ton of strawberries. If you have a bit more time try my strawberry rhubarb compote in the slow cooker. It is getting rave reviews! Did it make you want to try it? Please share your favorite way to enjoy strawberries. Slice 8 slices of cake and place on plates. Wash, hull, and chop strawberries into small pieces. Mash 1/2 of them in a bowl with a potato masher. 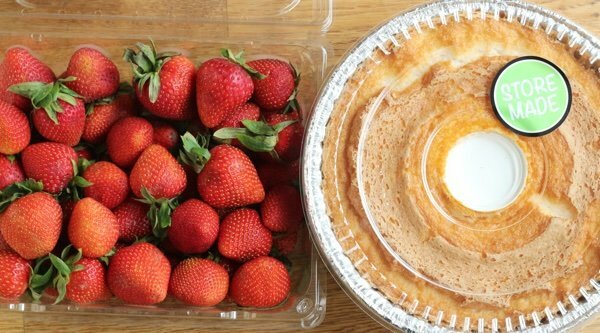 Mix in the strawberry pieces and divide into 8 servings onto the cake. Add whipped cream and enjoy! This is how I grew up thinking about shortcake. My mom always used angel food, and I didn't know that an actual "shortcake" was something entirely different until a year or two ago. I love both ways but use the angel cake most often since its healthier, and "just like mom made"
I love angel food cake! Am I the only one who thinks strawberries are super-sweet anyways? My daughter and I eat this all summer long. It's delicious and bonus - neither one of us like shortcake! I've eaten it that way for years and I actually like it better than traditional shortcake. It has a nice tang to it! So simple, even I couldn't screw this up! Thanks for this! 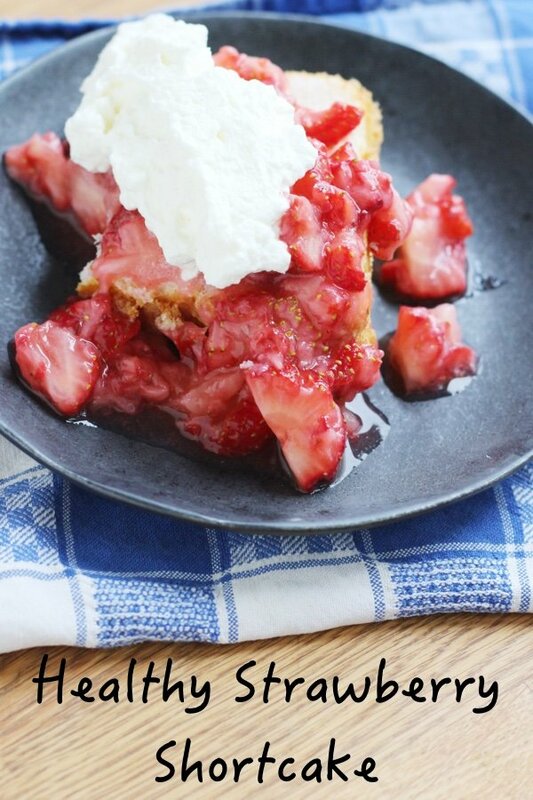 My family love strawberry shortcake and this is so much better for them. I'm sorry I never thought of it. I will be trying it! I've never liked the pound cake type either. This is one of those treats I have so rarely that I would go for my fave, calories and all, and I prefer shortcake over poundcake or angel food. I love the texture and flavor of the shortcake so much more, it's worth it. angelfood cake is the best but you could also do a variation w/ sugar free vanilla meringues! less calories & lots of protein! We have also always made it this way. The angel food cake is so much lighter and has a better flavor. I do usually add the whipped cream though! To make the shortcake "saucier" blend 1/2 of the berries into a puree and then pour over the top of the remaining berries and cake. Deelish! 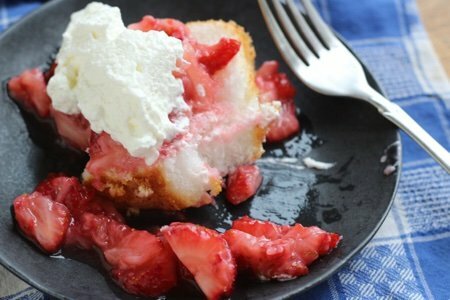 I like angelfood cake better too... although I do also add whipped light cream and I like balsamic vinegar with strawberries so I would marinate them in that first. Oh wow! I've learned something new today - I always thought it was supposed to be angel cake, too! I've never had it differently and I wouldn't dare think of changing it. We get these packages of four small, round angel food cake helpings that are slightly indented in the middle. Then we fill that hole with a huge scoop of strawberries and a dollop of low-cal, low-fat whipped cream! It's mine, my husband's, and our kids' favorite dessert! @Whitney, That's EXACTLY what we did too. So delicious, and healthy! I marinate strawberries with a splash of balsamic vinegar and serve over slices of homemade angel food cake. We prefer the lighter texture of angel food cake to the traditional short cake. My family always used my grandmother's homemade tea bicuits and real whipped cream instead of a cake. Its a real taste of childhood summer for me. Try it! I love Angel Food cake. We make strawberry angel food cake by buying a package of angel food cake mix and stirring in a can of strawberry pie filling. YUM, YUM!!! @Sparkina- YUM! This is what I knew strawberry shortcake to be.